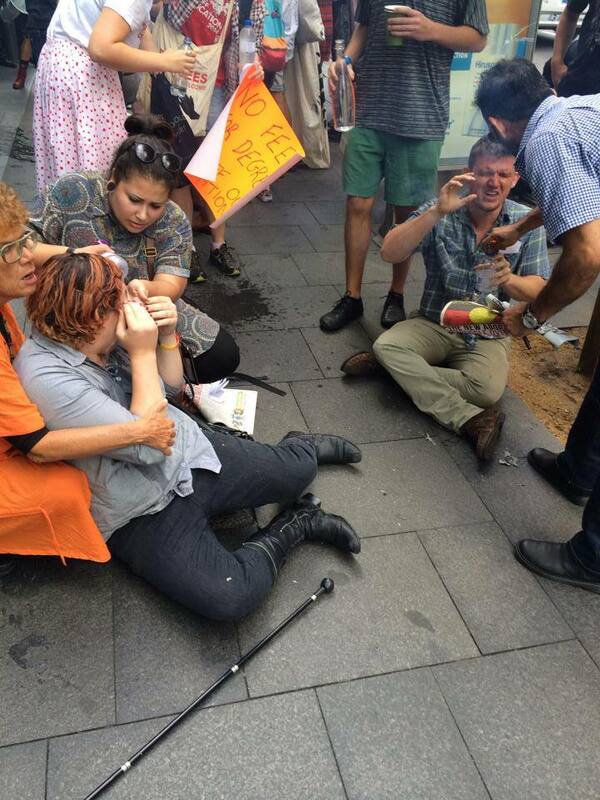 Students were pepper sprayed by the NSW police earlier today during a protest against Education Minister, Christopher Pyne. Student protesters had converged on the Sydney Masonic Centre to make known their continued opposition to the Federal Government’s proposed higher education reforms. Following a number of speeches in the building’s carpark entrance, the protesters attempted to enter through the front door, at which point they were physically prevented from entering and pepper sprayed. The police then pushed the recoiling crowd outside, blocking the door in the process. Students who were sprayed were treated with water and milk by fellow protesters on the scene. National Union of Students representative Ridah Hassan was held in place by a policeman as he pepper sprayed her. “I’m not sure why I got sprayed”, she said. Following the incident, several office workers from nearby buildings reportedly joined the student protestors, in condemnation of the police. NSW police were contacted for this story, but declined further comment.